Traveling is in my blood, it's in my core, and seems to be the thing, aside from my boys, that feeds my soul best. It is a nirvana that I hope never ends for us. Whether it is travel at home, exploring your backyard, or international full time travel you have to start someplace. And I have found that someplace usually includes a fair bit of, "how the heck do we get started? ", type of questions. I have been thinking a lot lately about what it was like when we started out on this current adventure. Some times when I see these questions on how to get started I think, jeez it's not rocket science, nothing to stress about. But that, of course, is coming 8 years after leaving the comfort of our home in CT. When I think back to how I felt in the beginning I am pretty sure I could have won some kind of, most over the top and stressed out mom, award. So I get it, I really do. There is so much to think about especially when leaving the life you've always known behind. So what are the most valuable things you need to have/sort out in order to start traveling? Everyone will tell you something different but I thought I would share what we find to be the most important things. 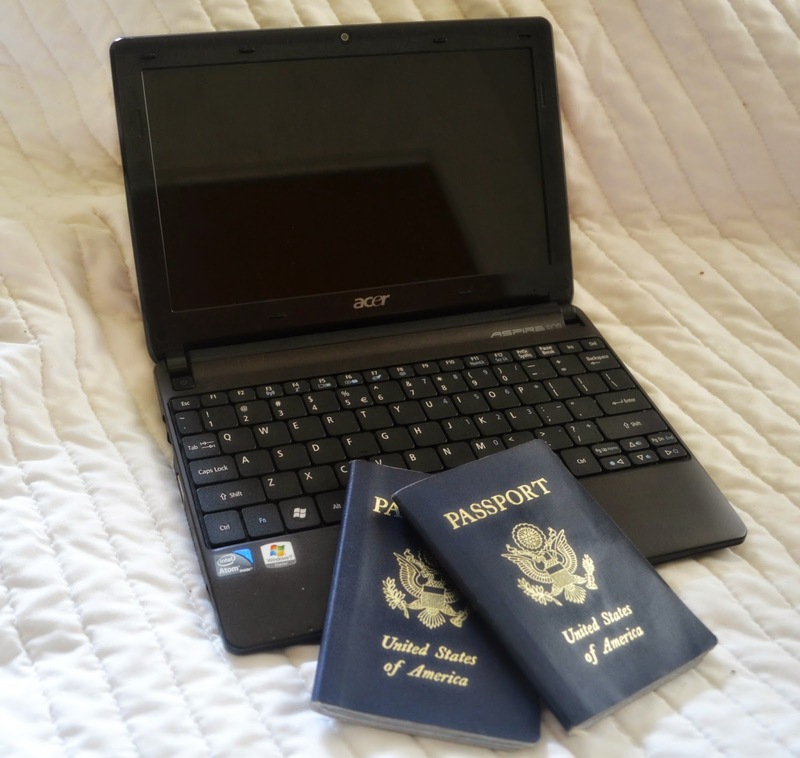 It may be a no brainer, but a passport is vital to any international travel. It is best to get one at least 2 months before you have any travel scheduled so you do not run into any delays that could lead to changing your plans. When air travel is involved this can be an expensive procrastination. It is also a good idea to have copies of your passport, multiple copies actually. Some visa on arrivals will require it yet do not have a copy machine to use so I have found bringing my own is best. I also copy any visas I get in case some one, such as myself, launders said passport ruining the pages inside. For super duper, extra protection be sure to also have a back up of the passport some place other than on yourself. If you get robbed and lose the precious folder where you keep all important documents you will be so glad you took the time to scan them and store them in a cloud. Whether it is set job, a blog up and running, a savings account, or travel insurance you will want to make sure it is all dealt with before you take off. Be sure your accounts will work all over the world and if you can try to use a bank that will allow you transactions without incurring a fee each and every time. If you will be using Paypal for anything be sure that it is all set before you leave your home country. Trust me, connecting accounts and dealing with them in general is far more difficult when you are not there in person. Leaving with a good chunk of savings is great but in my opinion it is even better to have a steady income flow of some sort. The savings will run out eventually and most likely faster than you anticipate. If you have a blog or some type of income stream that is steady you will have far less financial headaches during your travel. When it comes to travel insurance some people use it while others don't. There are pros and cons to both sides of that debate but the bottom line is that if something happens, injuries, stolen items, etc you will never be upset that you have it. It is super easy and many policies are not even that expensive. You can get online travel insurance or go through whatever provider you currently use for house/accident/health insurance at home. It may go without saying but I am going to say it anyway...it's that important! If you leave with nothing else leave with as much patience as you can muster. Travel is amazing, beautiful, inspirational, and endearing but it can also be wrought with heartache, gut wrenching sadness, mishaps, and downright frustrating situations. Having a good attitude and a healthy dose of patience will go a long way when confronted with one of the more difficult aspects to travel. Start with as much as you can and I guarantee that when your trip is done, you will walk away with even more. You can fight any situation you want but at the end of the day being impatient with people is not going to help or get you anyplace. Sit back and relax and save the irritation for the few moments where it may just do your cause some good. Traveling with a computer has its ups and downs. Sure it can be heavy and cumbersome and also something you constantly have to worry about but what it gives you back is vital in my opinion. We use our computers for everything from work to research to photo sharing and communication. You can stay in touch with loved ones, do schoolwork, and find out the best place to eat in any given area. Of course a smart phone or tablet can also get most of that done so choose which suits you best and go for the smallest thing that will cover all your bases. I know a lot of people equate a true travel experience with getting disconnected from technology but as someone who has traveled extensively with and without it, I would not travel without it ever again. Life is substantially more easy and connecting with friends and family helps in many situations be it loneliness, advice gained, or just sharing the adventure, however remotely. For many people taking pictures is a great way to make and keep memories, for others, such as myself, it is an integral part of any journey. After my family and friends, I think cameras are the thing I cherish most, so it absolutely had to make list. Smart phones have come a long way in picture taking capability and it's an easy way to connect on Instagram but sometimes you just need more, lots more in my case. We have an older smart phone that I have with us a lot, it is an IPhone 3 so as you can imagine the photos are just OK. I also carry with me a small point and shoot, which I keep on me for the just in case you see something awesome at a strange time pics. My pride and joy though is my Nikon DSLR. It is bulky and heavy so I do not carry it all the time but the photos I can capture with it are immeasurably better than those I get with the phone or point and shoot. I regret very few things but one thing I do regret is that I waited so long to buy a nicer camera. If you have the funds get one before you leave so you can enjoy great pictures your whole trip through. They will be your favorite and most lasting mementos! What do you think is essential to any trip? What types of things do you secure before you take off? As I am traveling, I think about the most important things in my life. What can't I lose? 1. My family! Gotta make sure everyone is accounted for! 3. Computers (because we need them to make money, which goes into your point on financial security). 4. Where is my wallet, cash, credit cards? (also, financial security). 5. Some method of taking photos. Everything else can be lost and picked up new a thousand times!